Learn the five factors to nailing occlusion in CEREC. Controlling occlusion on my restorations is one of the main reasons why I like chairside CAD/CAM. There is an abundance of online training videos posted at the kliminstitute.com website. For those that desire efficient access for learning for CEREC chairside CAD/CAM, this site is created for you. Check out the video Klim Institute Video Sample Room. 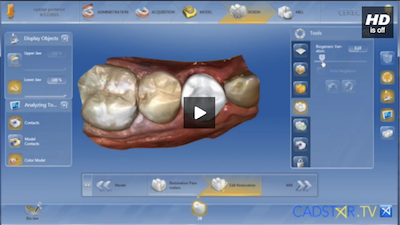 View New Online Training CEREC Content - New Content Link. Are we able to machine thin feather margins with CEREC without chipping? Oh yes, we can! In fact, I am going to make a quality statement. We can mill a "pressable" margin with the MC XL using the EF bur system. This video will review the clinical criteria for applying a thin margin to optimize the aesthetic results. Love the thin milled CAD/CAM margin when there is adequate enamel on the cervical margins. My presentation at Dentsply Sirona World 2017 was about aesthetic emotional closure and finishing the thin feather margin with the CEREC system. This video will cover my parameters and finishing technique.